Tarsier The smallest primate in the world. The friends of the reader,. This time sharing information about the world's smallest primates. Yupss .. this time we will discuss the Tarsier. Tarsiers are primates of the genus Tarsius, a genus of the family Tarsiidae monotipe, the only surviving family of the order Tarsiiformes. Tarsier is a primitive primates (Prosimii) of the family of primates endemic to Indonesia Tarsidae are scattered in the Islands of Sumatra, Sulawesi and Kalimantan. Animals tarsier has a small body, unique, and similar mini bears, so that the much-loved animals as a pet (pet). Tarsiers have large round eyes with sideways movement. How friendly reader? unique endemic to Indonesia is not an animal. Therefore we should preserve it, .. The benefits of Red Fruit ( Buah Merah ). On this occasion I will review about Red Fruit(Buah Merah). 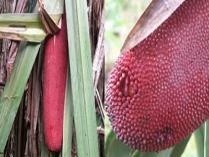 Red fruit(Buah Merah) plants are plants that are still one family with the pandanus plant. Pandanus conoideus in their habitat (New Guinea) grew from the lowlands near the coast to the highlands. In fact, on the slopes of high mountains Jayawijaya up to 2,500 m above sea level. These plants can be found in almost every region of Papua. These branched woody plants grow up to have five branches. Ribbon-shaped leaves are prickly-burr edges small. So many benefits of red fruit, As for the types of diseases that can be treated red fruit such as: AIDS, Cancer and Tumor, Stroke and High Blood, Uric Acid, Diabetes Mellitus (diabetes), osteoporosis, eye disorders, and still Increasing Intelligence contained many more benefits contained in the red fruit. Thus a glimpse of the red fruit(Buah Merah) ... may be useful. Betta Fish ( Cupang ).. Since my hobby of ornamental fish, .. This time I will discuss about Betta Fish (Cupang) Ornamental. 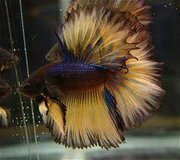 Betta fish(Cupang) is a freshwater fish native habitat are some countries in Southeast Asia, including Indonesia, Thailand, Malaysia, and Vietnam. This fish has a unique shape and character and tend to be aggressive in defending its territory. Among fans, fish hickey is generally divided into three categories, namely ornamental hickey, hickey complaints, and wild hickey. Betta fish are one of the strong fish survive for a long time so that when the fish is placed in a container with a volume of water slightly and without any air circulation equipment (aerator), these fish can still survive. Guppy fish with scientific name (Poecilia reticulata) was discovered by Robert John Lechmere Guppy, an Englishman who, in Trinidad in 1850. Since then the name of Guppy is used as a popular name for this fish. Guppy fish dubbed 'a thousand' (million fish) because the fish are easy and quick to breed. Guppy nature / wild 've also used as a tool to eradicate the malaria mosquito larvae. His ability to gobble up mosquito larvae proved to be effective to reduce the development of malaria. Until now natural guppy can easily be found in ponds, ditches and small streams. Guppy besides known as an easy fish to breed fish also has the nickname of 'rainbow' because of a variety of color patterns and many new patterns that appear when combined with other types.